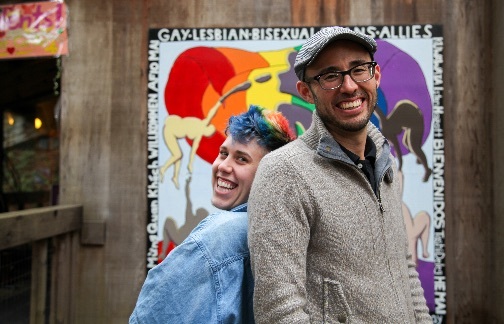 UC Santa Cruz students who identify as transgender, gender-fluid, or nonconforming and their allies have a new housing option on their applications for the fall—a safe and welcoming on-campus home in a supportive community. The new trans-inclusive housing option is the result of student activism that informed ongoing administrative discussions about how to better serve the trans community. “This is going to set a whole different culture shift on campus where people recognize that this is a community that matters and needs a space to be themselves without fear,” said Jamie Joy, 22, a graduating senior who was a student member of the All-Gender Housing Task Force. The task force made recommendations in June of 2015 for the establishment of two new trans-inclusive housing communities in fall quarter 2016. “It’s really important for students to have a place on campus they call home,” said Jamie, who prefers to not use a last name. Jamie, a double major in Community Studies and Feminist Studies, identifies as gender-fluid, nonconforming, nonbinary or genderqueer. For students like Jamie, who was discovering an evolving gender and sexual identification when arriving on campus as a first-year student in 2012, the idea of living in a welcoming and safe environment is fundamental to academic success. Just over 203 colleges and universities have gender-inclusive housing or housing in which students can have a roommate of any gender, according to Trans Policy Clearinghouse, which is maintained by Campus Pride, a national nonprofit organization created by LGBTQ and ally students. UC Santa Cruz has long offered students various room options based on academic pursuits, lifestyle preferences, backgrounds and hobbies, such as single or mixed gender, international living, creative arts, wellness and health, science and engineering, substance-free, 21 and older, and social justice. While students have had the option to request gender-neutral room options since 2009 and there are LGBTQIA-themed communities, this new trans-inclusive option seeks to provide a more intentionally supportive space for trans and gender-nonconforming students and their allies. “This is important because of the number of problems that transgender college students encounter on college campuses,” said Brian Arao, associate college administrative officer and housing liaison for trans-identified students. Students have reported discomfort and hostility from roommates that often misunderstand gender identity issues, which often leads to a sense of isolation. “We have heard from our students that at this point in time they feel it’s important to have critical mass in their communities, a place where there is understanding and acceptance among everyone on a floor rather than only a couple of people here and there,” Arao said. New students who complete the supplemental application for trans-inclusive housing will have the opportunity to live together in the Merrill College residence halls. Continuing and transfer students will have the option to live in trans-inclusive housing at Redwood Grove apartments. These students may room together regardless of gender or legal gender and will likely join a mixed-gender floor or apartment and share common areas. For those trans and gender nonconforming students who prefer to live elsewhere, the university housing department will continue to work with them on an individual basis as it has for many years. The reality is that people have varying level of preparedness to be inclusive and understanding, and students report that many still engage in behaviors that are transphobic, Arao said. While trans-identified people are often included in a broader group relating to sexual orientation, their experiences are quite different. Their issues have often been marginalized, Arao said. Jamie will be serving on the selection committee for the university’s new campuswide trans educator, a position created in part due to a student petition that circulated last year. Although graduating in just a few weeks, Jamie says the movement has been a special journey. “I’ve been really blessed to be a part of it,” Jamie said. “The community has gone from feeling really empowered to exhausted to really fed up to filled with love and filled with anger. It’s been tumultuous journey these last few years. As I’m graduating, I feel like the generations behind me know what’s in their best interests and will be able to ask for what they really need to survive. I work with queer and trans youth also and there is a rise in visibility and vocality. It can go only go up from here."